Are you looking for stockists of some of the finest furniture in Larne? When you are after affordable furniture for around the home including beds, wardrobes and sofas, come to the team here at Rea's of Larne. We stock a vast range of quality furniture to suit all budgets and tastes, so why not pay a visit to our showroom in Larne today to see our fantastic selection of furniture for yourself? Rea's of Larne is a family run company that has been trading since 1979. During this time our company has become known as one of the leading stockists of top quality furniture including sofas and chairs, beds, dining tables, carpets, wooden flooring and a rug gallery. We stock brands such as Fama, Lazboy, Ashley Manor, Wiemann, Sherborne and many more. Our showroom has ample parking for customers, many of whom travel Province wide to see our excellent selection. We are confident that you will find the perfect piece of furniture or flooring to suit your needs and budget. We also offer a free measuring service on all of our flooring and have a great team of fitters available if required. Need A New Bed? We Can Help! As well as stocking a tremendous range of flooring and furniture, we also have an excellent selection of beds which are all available at competitive rates and are of the highest quality. With brands such as Silent Night, Respa, King Coil, Mayers and many more in stock we are confident you will find the right bed for you. We offer free delivery province wide and are happy to help with assembly and installation of our furniture. Our extensive showroom is open from 9.15am-5.30pm Monday to Saturday, so if you would like to know more, don't hesitate to get in touch with us for more information. 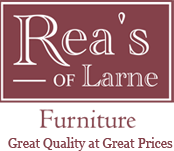 To speak to the team here at Rea's of Larne about a new bed or dining table, call us 028 2858 0003. Alternatively you can email us at reasoflarne@btconnect.com and we will get back to you as soon as possible.